Mountain Training offers programmes of training and assessment for walkers interested in leading groups as well as skills awards that teach individuals how to look after themselves in the hills and mountains. The UK and Ireland are home to a great many stunning locations and our work is dedicated to helping more people get out there and enjoy them. If you're finding it difficult to choose a scheme, read our blog article: Which scheme is right for me? Part of the Hill & Mountain Skills Scheme, the Hill Skills course is a practical introduction to the techniques required for hill walking. It is suitable for beginners and covers topics such as how to plan walks, become familiar with the use of a map and learn about the equipment required. You will also gain an understanding of the effects of weather, how to deal with emergencies and gain a valuable insight into the upland environment. The Mountain Skills course is part of the Hill & Mountain Skills Scheme and designed for walkers with a reasonable level of fitness who are interested in applying their countryside walking skills to the mountain environment. The course includes skills in map and compass, mountain weather forecasting, movement through steep ground, planning and preparation, emergency procedures, seasonal effects and the mountain environment. Our newest leadership award, the Lowland Leader Award, has been created for people wishing to lead groups on footpaths, trails and lowland countryside anywhere in the UK and Ireland. It is perfect for people in a position of responsibility whose leadership role is restricted to walking in these areas, such as the Duke of Edinburgh’s Award leaders, teachers and youth workers. 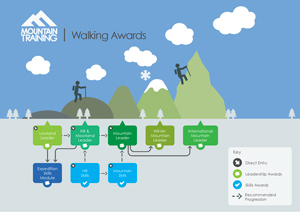 The Walking Group Leader Award was designed for people wishing to lead groups in upland, moorland, fell or down areas. The award focuses on the challenges faced by those leading in these environments such as navigation, route finding and group management. There is an ‘overnight experience’ element to the award which provides individuals with the basic skills required to take people to valley campsites or bunkhouses. The original mountain leadership qualification, which is now 50 years old! The Mountain Leader award is the benchmark for anyone wishing to lead groups in the mountains. Through a six day training course and five day assessment, complimented by your own walking experience, you will gain a thorough understanding of how to safely lead groups in mountainous terrain. This award is suitable for anyone wishing to take people walking in the mountains. The Winter Mountain Leader award operates in one of the toughest environments and is designed for people who plan to take groups out in the mountains in the unique winter conditions of the UK and Ireland. The use of a walking axe and crampons are vital components of safe winter walking and the scheme will train you to look after others in often very challenging conditions. The Scottish Highlands are the natural focal point of the Winter Mountain Leader, so a passion for ‘Scottish Winter’ is essential. The International Mountain Leader Award builds on the skills gained through the Mountain Leader Award and applies them to the international environment. Additional considerations include trekking at altitude, snow covered terrain and travelling overseas. The award is ideal for people hoping to lead groups anywhere outside the UK and Ireland other than where Alpine techniques are required.